“Your son has cancer”. Words no mother ever wants to hear. On June 8th my son, Tyler, just twenty years old was diagnosed with Stage 4 Metastatic Clear-Cell Sarcoma. The doctors at the University of Kansas Hospital tell us little is known about this rare type of cancer and they are unsure what treatment will look like at this point; trial and error they say. What I heard was wasted time and repeat disappointment. This is my son’s life we are talking about, not what fad diet works best for you or like trying on clothes at the department store. Time is of the essence and I know, even with the rarity of the diagnosis, that someone out there has the answers to give my baby his life back. His eight month old daughter Marlee should not be denied the opportunity to know how amazing her daddy is. Tyler has been playing baseball from the time he could fit a baseball in his hands. At the age of three years old his little feet hit the dirt field for the first time and on that day a love for the game was created. Before each game I would buy him the seasonal cupcakes hostess put out that were decorated like baseballs. I told him if he ate one of these before the game it would give him the extra power he needed to hit a homerun. That game he hit his first homerun and the tradition was born. As he graduated from elementary school to middle school the tradition faded and he kind of caught on to my shenanigans. He played his last high school baseball game at Hogland Park in Lawrence at the University of Kansas, in the group photo he holds a hostess baseball cupcake he purchased as a “thank you mom”. Baseball was not his only love. He was an all around athlete. He played basketball and soccer for several years and football was his other first love, it just depended on the season. It was more of a love-hate relationship really. He loved the game but it was brutal on his body. Every time he put on his uniform he played with all his heart and all his strength. This often meant sacrificing his body to do so. He knew when the game was over and he climbed out of all that gear that his feet would be barking, his back aching, and his arms bruised and sore. He would rest for the evening and be back at it the very next day. He lived for this stuff. During his sophomore year of high school his foot got cleated, stepped on by another player. This left a mark on his foot and as one could imagine it was pretty sore for a while. He taped it up and went on about his business as usual. This spot was revisited a few months down the road when it began to bother him again. It was now a bump on his foot. The school athletic trainer looked at it and said it looked like a bone spur. We continued to wrap it and move on, just like he would any other ailment. Tyler went on to play football at Central College in Iowa. This quickly ended after his first semester when he suffered a concussion he couldn’t recover from. He moved back home to attend community college close to home. It wasn’t long after Tyler returned home that we learned he was going to be a father. On October 2nd this beautiful, blue eyed baby girl was born. Playing ball had been his life. No matter which court or which field he stepped on he was right at home. When they laid this precious bundle of joy across his arms for the first time, it was as if he had already played this game a million times. He had done much in his life thus far to be proud of but the joy and pride he had holding her far surpassed any trophy ever won, any MVP ball handed or touchdown scored. THIS was his greatest accomplishment. After the news of Marlee’s arrival he knew he needed to find a way to support his new family. With completion of college on hold he landed a job with a company installing commercial and residential home automation. Elevated Electronics quickly became a second family. He loved what he was doing and was eager to learn more. They were excited for Tyler’s future with them. With just my youngest son Dylan at home I was left with much free time on my hands. I decided to pursue a passion of mine which was imbedded in my soul thanks to my mother. I can’t remember a time growing up where our home wasn’t open to someone who was down on their luck. It could have been family, a friend or even a friend of a friend. If there was someone who needed a pick me up and she had room, they were always welcome. Later when her dream of owning her own restaurant came true, she would give back to the community who had always been good to her over the years by opening up her place around the holiday to serve those less fortunate a warm meal. Each year she would serve between 100-200 homeless or food insecure people at her small diner. This was something all the customers and the immediate community looked forward to helping with each year. We did this up to the day she sold the business to retire. I didn’t realize how much I actually enjoyed it until it was gone. Most of those years I was a teenager or a young mom. It was just a thing we did, and I had to help. Fast forward to 2018. I work with a group called Free Hot Soup. I was fortunate enough to meet the founder of this group when it was on the ground floor. There were maybe 100-200 members in this group and most of them were her family and friends. Free Hot Soup in a grass roots group who are dedicated to feeding, caring for and befriending people who are often overlooked by society. They show up at the same time, in the same place each week with food, hugs and plenty of love for everyone. After my first outing with FHS I was instantly in love with the concept. Having dabbled in serving the homeless with a group of friends at different times through the year I had plenty of people and resources on board to attempt to help grow Free Hot Soup from the one location they served to now two locations. We found a prime location in a park in the middle of downtown and this became our home each Sunday. Our crew grew into this beautiful mixture of moms, dads, daughters, and grandmothers from all walks of life. It wasn’t religion, politics or social stature that bound us, it was the love for others and simple kindness. Today Free Hot Soup Kansas City now serves in 8 parks throughout the city serving a total of 1000-1200 people each week. With my kids now more grown I had ample time to pour into this group that I had grown to love. There are now over 6 thousand members in this Kansas City group and I know our city is kinder and more compassionate because of them. On June 4th Tyler called me in the middle of the night complaining of severe stomach pains and back pains. He had been fighting these pains off and on for the past couple weeks with no relief. His primary care doctor had been treating him for what she believed to be ulcers. I took him to the closest Emergency Room to try to find some comfort. This would be his third ER visit in a week. The first visit was while he was vacationing in Maine with family. They treated his symptoms of an ulcer and told him to follow up with his primary. The weekend came and this resulted in the second ER visit. They too said the same thing, take this and follow up on Monday. 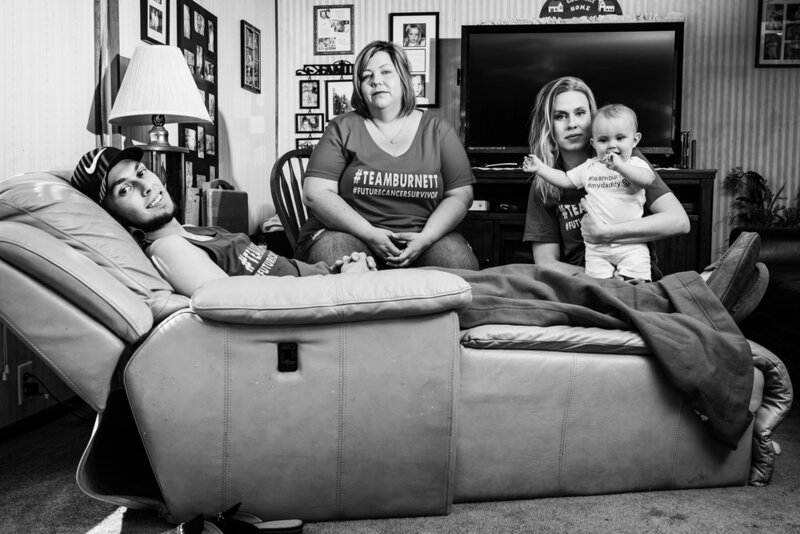 When Sunday hit he was doubled over in excruciating pain, something else was going on. While at this visit the emergency room doctor suggested a C-Scan of his abdomen. The radiology tech noticed his diaphragm was misshaped as if something was pressing down on it and asked the permission to order a full chest/abdomen scan. We waited a short fortyfive min-an hour for the doctor to come back in. He said “I do not see that you have any ulcers in your stomach that would be causing you this pain. What we do see is a 6cm mass in your right lungs, approximately twenty other nodules within and around your lungs. You also have lesions on your spine, vertebrae, pelvis and sternum”. With disbelief we sat there taking in these words we just heard. I asked what does this mean? “Your son has cancer and needs to be admitted right now”. Tyler said “I’m scared mom”. I was too. In that moment, our lives were forever changed. I walked outside to make phone calls to family and before I could barely get outside I hit my knees, waving my arms in anger, screaming “WHY, Why is this happening to my son?”. How could this even be? He is in such great shape, he is strong and healthy, how is this even possible? We arrived at The University of Kansas Hospital at 4am. They ran test after test. Each day they came back with more bad news. Initially they thought it could either be Lung Cancer or Lymphoma. They told us his survival rate and chances at a better quality of life increased if it came back as lymphoma. The next day they said the good news is that it is not lung cancer, but bad news is it is also not lymphoma, they believe he either has a type of Melanoma or Rare type of cancer called sarcoma. They proceed to say there is a lot of known treatment for melanoma, less for sarcoma. So again, we are left hoping for one type of cancer over the other for him. This was the reality we were now living in. Then four days later the final blow, the beast you are up against is a rare form of sarcoma called Clear-Cell. So, a rare type of a rare type or cancer AND there is no definite treatment? Perfect. It is time to tighten up our gloves and get to work because this will not beat us! Tyler has competed all his life, he knows what it takes to win. The PET Scan showed the primary tumor was a place on the top of his foot. The same place he was cleated his sophomore year, and the same place he had treated as a bone spur for now near 5 years. The cancer spread from this tumor up his left leg, into his groin, his pelvis then hit his midline and spread to his right and left lungs, his chest, scapula, and his entire spine. It is more than possible that his body had been showing signs of this for years. The aches and pains were masked by all the sports he played and his active lifestyle. Many of those pains now make more sense. There is a lesson here for all of us. Do not ignore your body. If you have a spot, a bump or a bruise that doesn’t go away or changes in color or size go get it checked out and don’t be afraid to ask for second opinions. This is your body and your life. When word reached our circle of friends the support for Tyler and our family poured in by the masses. His baseball and football families have been amazing. The support he has from his job and the connections they have been able to make for us have been astronomical. The more than 5000 members of Free Hot Soup (include link), the countless members of Kansas City Heroes and the close friends I have made along the way that I would have otherwise never crossed paths with have opened their hearts, opened doors we didn’t know existed and have given us hope that if there is someone out there that knows how to make my sons life normal again you will find us. We are not scared to be the first success story to beat Stage 4 Metastatic Clear-Cell Sarcoma. There is a little girl who is counting on it.